This watch is absolutely beautiful I have received so many compliments on it I looks much more expensive then what I paid ! Women's watch bands can be sized to fit 6.5 to 7.5-inch wrists. This watch is much much larger than I imagined. I've got an average sized wrist and yet this watch dwarfed my arm. It was heavy, too. It looked more like the size of a large man's watch. I wish they had included a photo of the watch on the arm of a.m. average sized woman to give me a better representation of its size. It's much too heavy to wear as a daily watch. Beautiful watch, size more for a man. This is a beautiful watch, but it is very substantial. 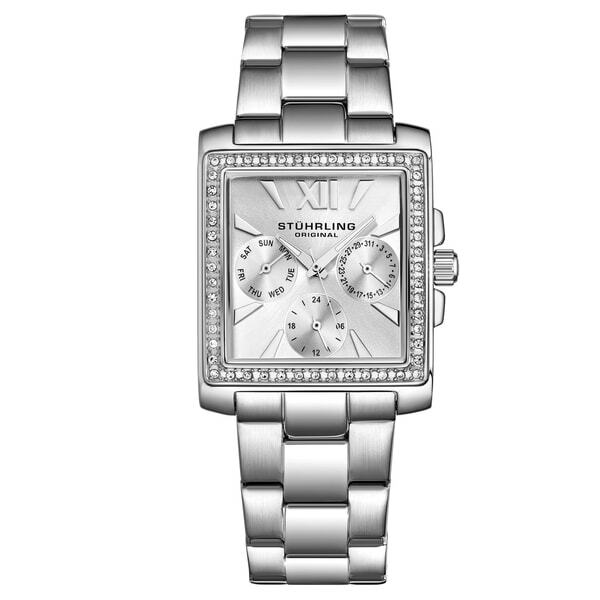 Although it is supposed to be a Women's watch, it could easily be considered as unisex design. It is not too feminine for a man to wear at all. this watch is beautiful, I really love how it feels, is strong, big and very stylish. great price. there are 2 more watches from Stuhrling that I want to buy. Very happy with my purchase. Very nice watch. Great quality and long enough for me to be a bracelet watch. I have got many comments on how nice it looks. I like that it has the day and date on it and hands glow in the dark. I was looking for an everyday watch with a date window. This was way too big and flashy for me. The date hand on the one I received did not work properly. I returned with no problem. I loved the watch. It had a masculine feel with a feminine touch. At first it felt a bit heavy but over time that went away. I had to take out a couple of links for a better fit, received many compliments and I love the brand. Would not recommend if you have a small wrist. ABSOLUTELY STUNNING WATCH! LOVE THE FACE ON THE WATCH AND THE DESIGN OF IT! The face of the watch is beautiful, looks very expensive. I'm very small,I will have to have it made smaller. But I love it!!! Been looking for a square face watch with style. And this one seems to have what I'm looking for. Looking forward to getting it to see if it looks as good on my arm as it does online. I liked the style. Reminds me of a Cartier Tank, but cheaper. Ha!